This very short routine shows how to wait for the vertical sync on the MZ-80A. Once the VSync is active you can begin modifying the screen. This routine makes use of the VSync (at address E002) to wait until display begins. 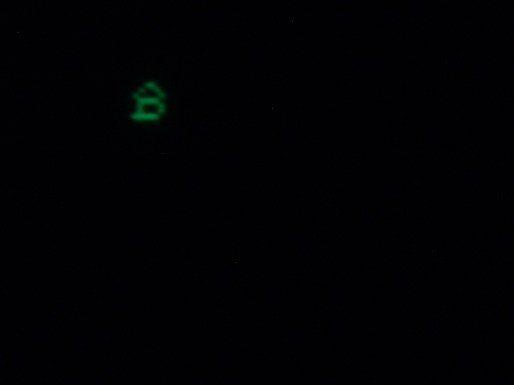 The display is set to inverse-video (via address E015) until a number of lines later when it is reverted back to standard video (via address E014). Pressing Space will exit the program. 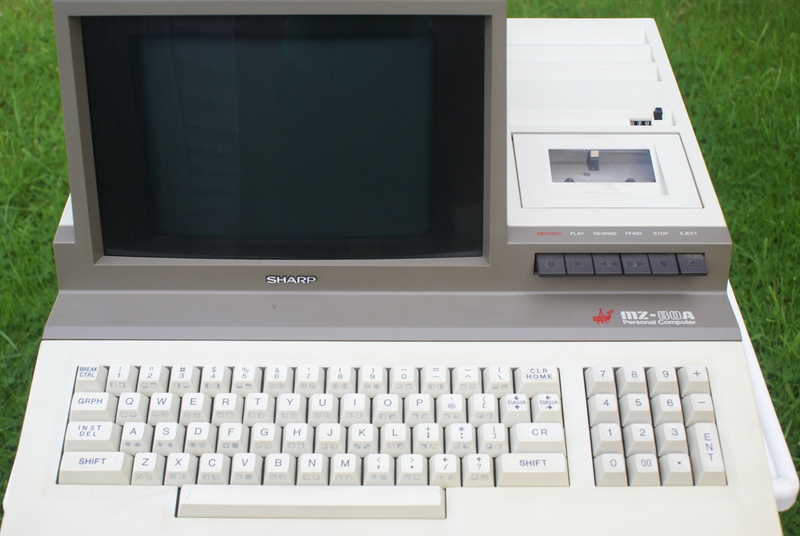 The MZ-80A has the unique ability to scroll its screen vertically in either direction without losing any display characters. To do this it has 2000 bytes of video RAM set aside for its display. 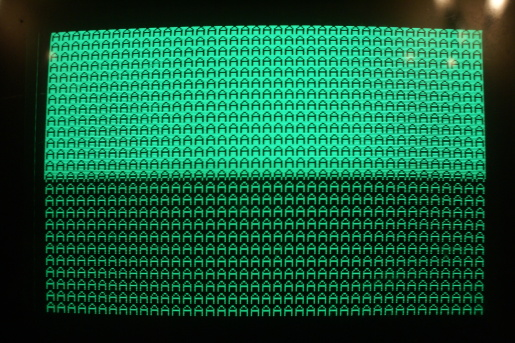 Only 1000 bytes are shown at any one time (the screen is 40 characters wide by 25 character lines). 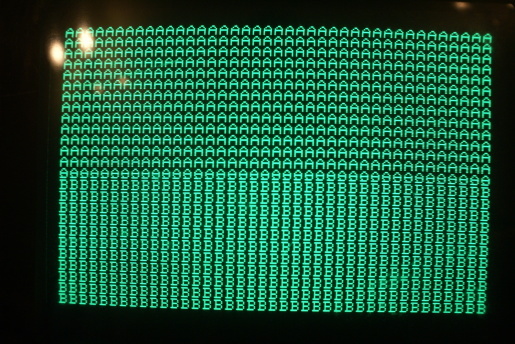 The particular 1000 bytes shown on the screen can be selected simply by reading one of the memory mapped I/O addresses between the address range E200 to E2FF (the display shifts by 8 characters at a time). This 2000 bytes can be useful as a double-buffer for games. With this knowledge we can fill one set of 1000 bytes with, for instance, the character ‘A’ and fill the other 1000 bytes with character ‘B’. 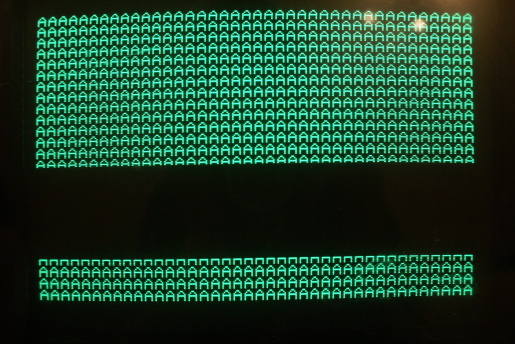 Halfway through each frame we can suddenly change the pointer to VRAM and roll the screen down to the next 1000 bytes. Finally we can roll the display all the way up again for the top of each frame. You will see, with the below code, that this can happen at any line and it splices the letter ‘A’ and letter ‘B’ horizontally down the middle. This technique can, no doubt, be put to great effect in games to create smooth pixel-by-pixel transitions between different ‘playfields’ which are stored in different parts of VRAM. The switch of the VRAM pointer is very quick so many changes could potentially happen per frame.